Mazagan Beach Resort is a truly unique 5-star luxury golf holiday destination, less than an hour drive south of Casablanca International Airport with an inclusive transfer service for Mazagan Beach Resort guests. Mazagan overlooks the Atlantic Ocean and is on the doorstep of two beautiful historic Moroccan towns of El Jadida and Azemmour. The resort covers some 250 hectares alongside a superb 7-kilometre beach. The region also enjoys a mild, temperate climate year round. The finest flavours of Moroccan gastronomy blend in with international cuisines in the eleven restaurants and bars at Mazagan Beach Resort. Gary Player’s Mazagan Golf Club is classic championship links golf, and from the back tees – the longest course in Morocco! Listed Golf Packages for Mazagan Beach Resort already include a 15% Early Booking discount. Offer Conditions: Book 30 days in advance. Supplement applies for late booking. Listed Package Prices: Listed Golf Package prices apply when booked at least 30 days before arrival. Book Mazagan Beach & Golf Resort for 8 golfers and the Group Leader or PGA will stay for Free with Unlimited Golf! Group Leader Offer may not be combined with any further Group Discount. Listed Package Prices: Listed Golf Package Rates apply with Group Leader Free of charge. 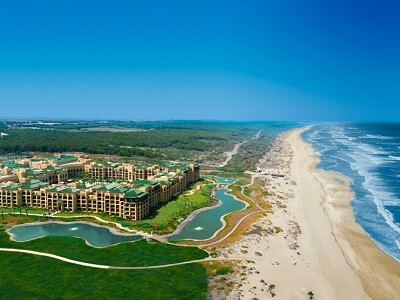 Enjoy Unlimited Golf at Mazagan Beach Resort, Morocco. The Mazagan Golf course has been designed by Gary Player, the South African golfer who is considered one of the greatest players the game has ever seen. His biggest titles were won on links courses, a major source of inspiration for creating and designing the Mazagan Golf course. The Mazagan Golf course, is a par 72, 18-hole links course alongside the beach, following the contours of the dunes and natural features of the land. The Mazagan Golf course was designed with focus on respecting this environment and conserving its natural character and wonderful sea views. Golfers of all levels of ability are drawn to its 'heroic shots,' while its broadened fairways are very forgiving for the less audacious player. The Mazagan Golf course is run by Troon Golf, a company with a worldwide reputation, ensuring a personal welcome and personalized service. After an invigorating round next to the sea, the Club House welcomes you to its restaurant or terrace overlooking the Atlantic Ocean. A bar and pro shop are also available. Unlimited Golf also includes Unlimited use of driving range, practice facilities and range balls! King & Queen Deluxe rooms (42m²/44m²) Deluxe Twin rooms with 2 queen-size beds. Gracious Moroccan inspired decor. Satellite television, Wi-Fi, safe and minibar. Elegant bathrooms with bathtub, ample shower, hairdryer, inter-connecting rooms. Mazagan Suites (82m²) including suites equipped for disabled guests. These spacious suites comprise a bedroom and a separate living area. Each Mazagan Suite can inter-connect with a Deluxe Twin room suitable for families. Executive Suites (140m²) of surface area comprising a large bedroom with king-size bed and a separate living area, and all with magnificent views of the Atlantic Ocean. Large bathroom with double washbasin, bathtub, spacious shower, and separate toilets. Each Executive Suite can inter-connect with Deluxe Twin room. AMBASSADOR Suites (231m²) Comprising of a very large bedroom with king-size bed and a vast and luxurious separate living area, and both with superb views of the Atlantic Ocean. Each ambassador Suite can inter-connect with Deluxe Twin rooms. Royal Suites (2) (342m²) located on the top floor at the front corners of the building each comprising a vast bedroom with king-size bed, a dramatic panoramic living area with breathtaking views of the Atlantic Ocean, and two 25 and 35m² terraces. Each Royal Suite can inter-connect with two Deluxe Twin rooms. At Mazagan Beach Resort dining is a unique experience, combining the very best of world cuisine with the subtlety and variety of Moroccan gastronomy. OLIVE'S Restaurant At the heart of the resort on the ground floor, overlooking the lush landscaped courtyard gardens and swimming pool, serves Italian and Mediterranean dishes - as well as a comprehensive choice of olive oils and a buffet of Italian ice creams and pastries..
SEL DEMER Restaurant Serves specialities fresh from the sea prepared the local way or grilled on the king-size barbecue, as well as a mouth-watering range of tapas. Spanish specialities are also served, with traditional gazpacho and paellas from the Valencia region – and the restaurant’s magnificent rotisserie means you can also sample the renowned Portuguese Peri-Peri Chicken. MARKET PLACE This restaurant, located on the first floor and offering panoramic views of the lush landscaped courtyard gardens and swimming pool, serves the best of Middle-Eastern, North African, Indian and Asian offerings. Three separate grills enable guests to choose exactly how they want their meat or fish cooked. And the superb dessert buffet with its selection of Moroccan pastries, fruit, ice creams and sorbets offers irresistible deserts. MORJANA Restaurant Located on the first floor of the hotel, this restaurant provides a stylish Moroccan setting in which to enjoy a subtle blend of tradition and innovation - both as regards the cuisine served here and its presentation. From the Doukkala region’s celebrated tajines to seafood pastillas, from royal couscous to kebabs - and not forgetting the arrays of mouth-watering pastries - each dish has a delicious surprise in store. And guests can choose from a selection of the very finest Moroccan wines to add a final touch of perfection to the meal. Open evenings only. ATRIUM Bar This typically Moroccan lounge bar in the heart of the hotel lobby is the ideal spot to meet and relax over a plate of traditional pastries and a glass of mint tea. Continental breakfasts are served here in the morning, and light meals, teas, coffees, ice creams, drinks and snacks through the day. OASIS Pool Bar & Restaurant: Located on the terrace, alongside the swimming pool, this casual restaurant serves light meals, mezzes, salads, grills, and fresh desserts. PALM GRILL Set within the Casino, the restaurant serves light meals, including salads, mezzes, grills and Moroccan specialities. LE CLUB This private lounge, located on the top floor and enjoying spectacular views over the Atlantic Ocean, is reserved for guests with “Club” privileges. It serves s breakfast, snacks and drinks available throughout the day. Sanctuary nightclub A magnificent and pulsating nightclub created specifically for Mazagan Beach Resort by designer Jeffrey Beers with internationally acclaimed nightclub innovator Raymond Visan. • At the Fitness Centre, the personal trainer will draw up a tailor-made training programme for guests and will have much invaluable advice to offer. The Fitness centre is equipped with the state-of-the-art exercise machines. The Pilates and Yoga room holds daily classes. • The Mazagan Spa, managed by ESPA, features 12 treatment rooms (including 2 double treatment rooms) and a luxury two-person suite and provides a wide range of body and facial care treatments. • Lie back and relax in an authentic Hammam and experience the many virtues of traditional Moroccan body care. • The Spa Beauty salon offers manicure, pedicure and hairdressing by Lucie Saint Clair. • The Kids Club (for 3 to 11 year-old) and the Teens Club (for 12 to 17 year-old) offer everything children could wish for. A specialised team is on hand to organise varied daily programmes designed to ensure that younger guests make the utmost of the resort, the magnificent beach, their private swimming pool, the sun and the ocean – and there’s also plenty of opportunity to go horseback riding, an age-old tradition in the Doukkala region. • The Teens Club provides a whole range of electronic games with network play to choose from, giant screens for movie fans, and a discotheque area for evening entertainment. Sports activities and coaching also form part of the daytime activities. • And finally, there’s the Baby Club, open to babies of 3 months and above from 10 a.m. to 6 p.m. Baby Sitters are available outside these times. Discover El Jadida. Once a fortified fortress port for the Portuguese galleons dating back centuries ago, El Jadida was granted prestigious UNESCO World Heritage status. Built by the Portuguese between 1510 and 1520, El Jadida (The New One) was square-shaped like a castle, with four towers at each corner, called 'Castro Real'. However, the construction of the fortified enclosure took 30 years, taking until 1541 to complete. A four-sided enclosure surrounded the city, built around the citadel. The centre of the citadel, a large arms room comprised on the ground floor, was converted in 1941 to a water tank to provide water supply in the event of a siege. This water tank is one of the most attractive and interesting sites in the city of El Jadida. The Portuguese city of Mazagan (El Jadida) became a UNESCO World Heritage site on 30th June 2004. Visitors to the town are impressed by the mystique of an ancient fortified town enclosed by walls or the historic buildings that line winding streets. The town hosts many festivals and colourful souks or markets. The Mazagan Golf Club, is a links course alongside the beach, designed with respect to this environment, conserving its natural character and wonderful sea views. Golfers of all levels of ability are drawn to its 'heroic shots,' while its broadened fairways and several tee-options are forgiving for less experienced players. The dunes and valleys which feature throughout this links course have been entirely created with sand from the region. The type of grass used, the Paspalum, a Platinum variety, is the ultimate choice for fairways, tees and roughs. The Clubhouse comprises a restaurant, a magnificent terrace overlooking the Atlantic Ocean, a bar, a pro-shop, and 2 dressing-rooms with lockers. Management is in the hands of the world renowned golf management company, Troon Golf, ensuring a personalised experience and top quality service. The Mazagan Golf Club was designed by Gary Player, the South African golfer who is considered one of the greatest the game has ever seen. His biggest titles were won on links courses, a major source of inspiration for creating and designing the Mazagan Golf Club. Garden View Room, All-Inclusive Board, Unlimited Golf, Casablanca Airport Transfers, Local taxes. Value Added: 3x50% Offer Spa Vouchers; FREE biking, fitness, tennis, hamman; Return Shuttle to El Jadida; Free access for Kids Clubs, Free access to Casino & Nightclub.